BANGI, 8 May 2014 – Efforts are underway to find out why the same species of animals are reluctant to mate between different populations even in a small area, such as the marine animals around Tioman and the waters off Pahang and the east coast of Johor. Molecular biologist Professor Dato’ Dr Rahmah Mohamed, who was with The National University of Malaysia (UKM) until recently, said the low incidence of inter-population breeding of some sea animals does not augur well for the future of several species, particularly invertebrates and fishes. Speaking with several scientists and Malaysia’s Marine Parks Department in Tioman recently after a UKM expedition to collect marine animals there, Prof Rahmah said researchers noted in-breeding occurring within each population leading to low reproduction and the decline in the number of organisms. She expressed fear that it may drastically reduce population sizes of the sea animals along the coast of Pahang and Johor and could lead to their eventual extinction. 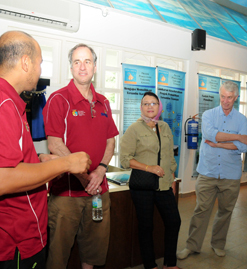 The other scientists in the discussion were UKM Nobel Laureate-in-Residence Dr Sir Richard Roberts, the Director of the Ocean Genome Legacy (OGL) Prof Dan Distel and UKM’s Marine Ecosystems Research Centre (EKOMAR) Director Associate Prof Dr Shahriman Mohd Ghazali. OGL is a non-profit environmental research organisation in the United States dedicated to creating new methods for study and conservation of marine species through understanding and protection of the world’s greatest ecosystem. They agreed that it was important that the reproduction rates of the diverse marine species be enhanced to help save them. Initial investigations and the recent Tioman Seribuat Scientific Expedition had found the dwindling population of invertebrates such as stag-horn coral and sea cucumbers as well as fishes. Some pointed to pollution and the pressures brought about by tourism that had hastened the species’ demise. Prof Distel said the oceans are the planet’s most influential but least understood ecosystem – a complex web of interacting species upon which all life depends for food, climate and even the air we breathe. “To protect this vital natural resource from the threats of global warming, habitat destruction, over-fishing and pollution, we will need a much better understanding of the diversity of marine life,” Prof Distel said. He cited OGL’s world-wide research on Minke Whales which found that the mammals did not reproduce when males and females from different populations were brought together. “They seemed to have different cultures that made it difficult for them to socialise or inter-mingle,” he said. It is estimated that nearly one third of all major commercial marine fisheries have collapsed. Production has dropped below 10% of historic levels and 25% of all coral reefs have already disappeared. Serious intervention was needed to preserve the remaining fisheries and reef ecosystems as they may collapse within the next 25 to 50 years. These changes come at great expense to humanity in the form of decreased food supplies, fewer jobs, reduced quality of life, lost livelihoods and lost opportunities. Dr Shahriman said the extraordinary diversity of life in the oceans is a resource of incomparable value. “We depend on marine life for food, employment, recreation and the variety of essential ecosystem”. For example the complex web of life in the sea produces half of the oxygen we breathe, processes much of our waste, and powerfully influences the temperature, rainfall and climate of the planet, he said. However, this web is delicate. Rising ocean temperatures, acidification, pollution, habitat destruction, over-fishing and other human activities are taking a grave toll on virtually all marine species and ecosystems. Dr Roberts, who won the Nobel prize for his discovery of introns in eukaryotic DNA and the mechanism of gene-splicing, said all nations needed to contribute to the conservation of marine biodiversity. He expressed concern that it was hard to gain knowledge about accurate models of ecosystem functions and dynamics and the accurate monitoring of conservation outcomes. Dr Shahriman agreed that the success of such efforts depends heavily on accurate assessment of current and historical biodiversity. Current marine conservation efforts focus on regulation of fisheries, coastal development and pollution as well as on the creation and enforcement of protected areas. He surmised that good information and strong basic science knowledge are the essential keys to successful conservation management. However, the oceans are vast and much of their biodiversity is hidden in locations that are very difficult, dangerous and expensive to visit and observe. As a result, the majority of marine species have not yet been discovered, named or adequately described. Many will disappear before their existence is even known. Moreover, the biodiversity of the oceans are also vast. For example, 33 of the 34 major lineages of animal life (phyla) are represented in the oceans, as compared to only 12 in the terrestrial world. Cataloguing and preserving this diversity is an enormous task that will require new approaches and new ways of thinking. EKOMAR under UKM’s Faculty of Science and Technology aims to become a platform that brings together researchers from diverse academic disciplines to conduct holistic research approach on tropical marine ecosystems particularly those within Malaysia. Currently its researchers cover a wide range of academic discipline from mainstream marine sciences to coastal engineering. They are also working closely with research partners from other local universities and agencies, such as the National Oceanography Directorate, Department of Fisheries and the Department of Marine Parks Malaysia who also share its view in the importance of research on marine ecosystems.